Parking at San Javier Airport, just outside Murcia, can be an expensive endeavour but those residents in the know avoid using the terminal car parks whether for long term or short term parking and instead they search for safe secure parking at a fraction of the daily rate just outside the main airport parking. San Javier is a fairly new airport which ideally services holiday makers and residents alike from around Torrevieja, Santa Pola, La Manga, Villamartin, Camposol, Cabo Roig, Rojales, Mil Palmeras, Punta Prima, Guardamar, La Zenia, Crevillente, Elche, Mazarron, Cartagena and of course Murcia – basically any urbanisation town or city on the Southern Costa Blanca is likely to be as close to Murcia airport as it is to Alicante airport. 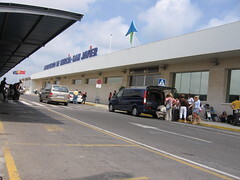 San Javier has become a good alternative to Alicante Airport (El Altet) as it is also serviced by budget airlines such as Ryan Air, EasyJet and Bmibaby and Jet2.com, adding only an extra thirty kilometres travelling time to resorts on the Northern Costa Blanca, there are siginificant savings to be made on these cheap flights. The parking rate at San Javier Airport is far more reasonable than the parking at Alicante Airport, at €7.50 for the first four days and thereafter the parking rate falls to €6 per day. This is half the price you would pay at Alicante so there isn’t so much need to seek out cheap parking on the airport outskirts, still if you have to park at Murcia for a relatively long-time, you will save money. These cheap parking services are offered by enterprising companies who have acquired land close to the airport where you can park your car and then get on the shuttle bus service which takes you to the airport and picks you up on your return. The parking lots are secure parking lots most of which have security systems or staff and which are safe for you to leave your car. Some companies even offer to valet or wash your car for you so when you arrive back at the airport it is in perfect condition before you pick it up. It generally works that you drive up to their premises, drop your car off, load up your luggage to the transit van and they will take you to the airport. On returning to Murcia airport you give the company a ring and they will pick you up and take you back to the parking lot to pick up your car. The shuttle service is usually also included in the price. There isn’t much competition between the companies as there is for Alicante so here are the cheap car parking companies that have been recommended for you to use for flights departing from San Javier near Murcia. At Seguro Parking prices start at €12 per day but become less the longer your car remains on their lot. Seven days cost €35, fourteen days €50, twenty-one days €55, a month €65, two months €110, a whole year would cost €299. At Plane Parking you can expect to pay €6 a day for your car to be parked outside, €10 for indoor parking at Murcia airport. After six days parking becomes cheaper. An annual rate will cost €300. Park & Fly are a park and fly company that offer clients a meet and greet service at Murcia airport. “We also have a shuttle service that runs to Alicante. We are the cheapest (considerably so) in the Murcia region. An additional service that we offer our clients is that every time they park with us their car is cleaned inside and out upon their return at no additional cost. We are based 3 minutes from Murcia airport, Carratera N-332 San Javier, Murcia (exit 784 off the AP-7). At Murcia airport you have cheap flights and cheap parking at their best. Murcia Airport Parking Page Summary – If you are interested in parking your vehicle whether a van, car or motorcycle, at Murcia airport and you wish to find out the cheapest place to park, then our article on parking at Murcia airport lists many companies offering low-cost parking services as well is giving information for the official shortstay and longstay car park at the airport. * Please note that obviously these prices and rates are subject to change but were correct as of July 2011.